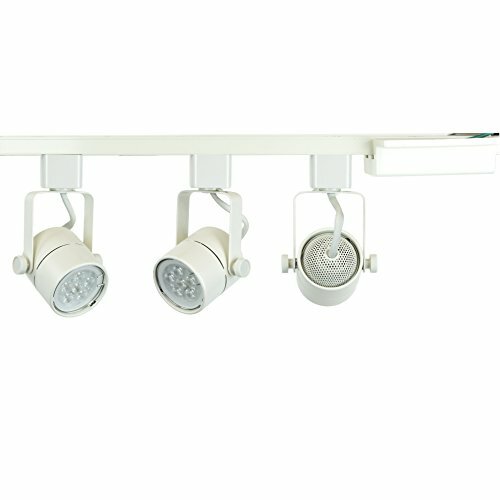 Each white finish track lighting kit comes with 3 of GU10 base 7.5W Warm White LED light bulbs, 3 of line voltage track fixtures, 1 of floating feed canopy (power feed), and 1 of single circuit 4-ft track. The kit can be mount on a flat surface. The H system (3-wire-1-circuit) track lighting kit required hardwired, the floating feed canopy give users more flexibility to powered anywhere along the track. The classic designed cylinder line voltage track head is an ideal accent lighting choice for retail store lighting, gallery lighting, display lighting, task lighting, product highlighting, and residential lighting purpose. COMPLETED KIT INCLUDES : 3 of GU10 LED Bulbs, 3 of line voltage track fixtures, 1 of floating feed canopy (power feed), and 1 of H system single circult 4-ft track. LED : GU10 LED Bulb 7.5W each head (equivalent to 50W halogen bulb), 3000K Warm White, 500 lumens, 40° beam angle..
DIMMABLE : Compatible dimmers Lutron DVCL-153P, MA-600, D-603P, MA-600/DV-600P. Leviton 6631, 6681, 6633, TT106. AIMING : Each track fixture can do 180° horizontal rotation and 90° vertical project. RATING : ETL Listed. Rated for Indoor use or Dry locations.